In an effort to comply with the EPA's MACT (Maximum Achievable Control Technology) Standard, a Big Three automotive manufacturer made the change from wet scrubbers to multiple-state composite mesh pad technology in its hard chrome plating line. 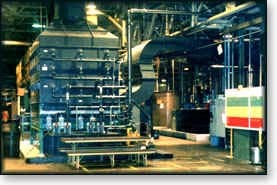 The Ohio company operates a large number of automatic, high-production chrome plating lines for plating on shock absorber struts. For over 30 years, the company's hexavalent chrome control equipment had consisted of many roof-mounted wet scrubbers that were periodically replaced with new models as the chrome attached the old and caused them to leak and eventually fall apart. In addition, the wet scrubbers damaged the roof and surrounding property when they occasionally discharged chrome mist. 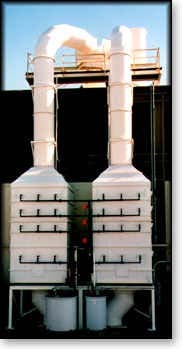 In the late 1980s, the company embarked on a large-scale experiment involving mesh pad-equipped dropout boxes fit to the wet scrubbers. It was a failure. Faced with the impending EPA MACT Standard for chromium emissions, the manufacturer decided to change the wet scrubbers over to composite mesh pads. Competitive bids were solicited from several manufacturers of mesh pad mist eliminators for the first of six 45,000-CFM units. If that first unit operated successfully, the company planned to purchase an additional five units from the winning supplier. Midwest Air Products Company, Inc., (MAPCO) of Traverse City, MI, submitted specifications for its Enforcer III™ chrome scrubber and Terminator™ fume hood, equipped with an internal mesh pad pre-filter. The Enforcer III chrome scrubber has been tested by certified independent labs and has been found to perform below 0.004 mg/amp hour, with some systems tested lower than 0.0001 mg/amp hour. Additionally, all stages of this scrubber can be washed down without shutting the system down. The Enforcer III Eliminator Scrubber can be washed down at all stages without shutting the system down. Similar to in-line style eliminators, the Terminator fume hood is equipped with removable washdown spray headers and single- or multiple-stage mesh pads contained in removable drawer assemblies. This design is incorporated into a heavy-duty hood, custom-built for individual applications. These fume hoods can be designed to drain all washdown effluent directly back to your process tank. This is accomplished via a sloped hood bottom and drip lip that directs effluent back to the tank. Each time the pads are washed, the hood interior is also cleaned. The Terminator design is ideal for applications where chemical reclamation and zero-discharge are desirable, and where contamination of tank solution is unlikely. The Terminator Fume Hood comes equipped with removable washdown spray headers and mesh pads. The Enforcer III Eliminator scrubber/Terminator fume hood system complied with the customer's requirement that daily effluent production not exceed 135 GPD per exhaust system. In addition, installation of the pilot exhaust system proceeded smoothly and stack testing of the finished system indicated a chrome emission concentration at a stack of less than 0.00661 mg/dscm, with average daily effluent production of only 70 GPD. The new system enabled the Big Three automotive company to comply with the EPA MACT Standard regulations for chromium emissions. Satisfied with the performance of the Enforcer III Eliminator scrubber/Terminator fume hood system, the customer ordered the five additional units. An added bonus was that the chrome emissions from some of these later units tested as low as 0.002 mg/dscm. Midwest Air Products Company, Inc., 281 Hughes Drive, Traverse City, MI 49685-5319 Phone: (800) 976-2726 Fax: (231) 941-1636.